We began with the premise that doubling with DO- and IO-CLs requires that both elements of the chain agree in features. With IOs, doubling is universal because the features of the IO argument are practically irrelevant (section 1.1). However, since DO-CLs are inherently specific, this feature is crucial for DO-doubling to be grammatical. Animacy is the second feature necessary in most contexts. However, as pointed out in section 1.3.1, doubling may operate even in the absence of the latter. The same matching of features required of doubling constructions is required under extraction (a subset of doubling structures), hence, no special mechanisms are needed to reject ill-formed sentences. What causes ungrammaticality in extractions from CL-D DOs is a clash between the specific referential CL and a nonspecific interpreted object argument, a violation of the Matching Principle. Since lexical partitives and unagreement phenomena are productive ways to signal the specificity of the DO, extractions at LF and in the syntax proper can produce well-formed sentences (section 2.2). Moreover, the Matching Principle follows directly from the unique indexing peculiar to chain coindexing and Spec-head agreement. For extensions of our main hypothesis to other Spanish dialects see Suñer (1986). Interestingly, datives are also NPs in Hebrew (Borer and Grodzinsky 1986). I am indebted to many people for their help with data gathering and for discussing parts of this paper with me. I would especially like to single out M. T. Viñas Urquiza for her patience and understanding. My sincere thanks to M.-L. Rivero, G. Chierchia, W. Harbert, O. Jaeggli, J. Aissen, J. Némethy, I. Alemán, M. Yépez, I. Comorovski and my students in the Fall 1985 Seminar on Clitics. 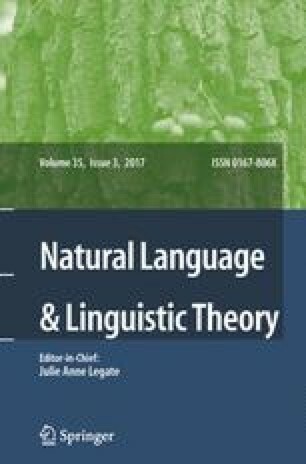 Credit is also due to the anonymous NLLT reviewers for their suggestions and to F. Heny and J. Maling for their editorial expertise. Part of this research was supported by a Cornell University Faculty Research Grant.